Brian’s father was Frederick David Arbon (1911- 1968) and his mother Florence Esther (Blatch – maiden name, 1907- 1940). Fred was from Thriplow and had got a watch from the County Council for attending school for 8 years without any absences. During WW2 he was a leading aircraftsman and later worked as a time-keeper at Spicers, Sawston. He would cycle to work there from Harston. He is shown in photo of pub outing, 5th from the right. After the war Brian’s Uncle Bob lived in Harston, in a caravan in an orchard, next to where Cheryl Smith lived. Bob had been a POW in Japan and Brian has his medals. He was only 42 when he died. 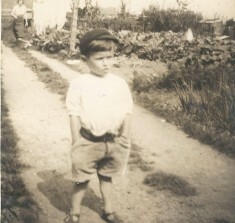 Brian was born in 1936 in Harston. At the age of 3-4 he moved with his family to Thriplow as seen in the picture. 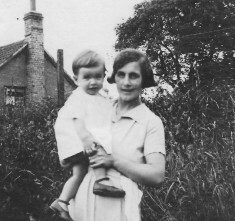 Another picture shows his mother Florrie and him at Thriplow. His mother died when he was 4 in 1940 and she was buried at Thriplow. 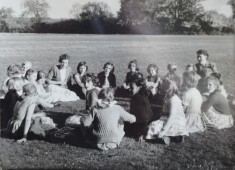 His father married Ruth Mary Holdgate (born Ongar, Essex) in 1941 and as he was in the RAF stationed in Egypt in WW2 his wife Ruth ( 1922- 2015) and children went to stay with her Holdgate family in Ickleton. It was very crowded with 8 children and parents. Brian went to school in Ickleton for a while. After the war they moved back to Harston and lived in the end terraced house, next to the present Post Office on the High Street. The Pasks were their landlord and Brian remembers going across the road to the Pasks house, into a very dark room, to pay the rent. The Arbon house was two up, two down, so was very small for their family. 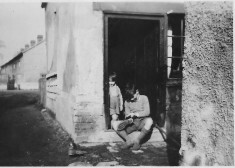 Brian can be seen cleaning shoes on the back doorstep, with his brother Robert behind him. They had a coal fire with oven above it and had free standing oil lamps on the tables. They didn’t get electricity until they moved to Queen’s Close. It had one cold water tap, but originally had a well. Down the lane next to their end of terrace were coalsheds made of chalk for each house, next to the back access to the terrace, and behind them a block of 4 toilets. (At some later stage the end of terrace house was knocked down, but in 2015 anew extension was added to the end of the terrace). A man would keep the drains clear along the main road- the High St- near their house by digging out the detritus. One day Rob, on his way to buy a loaf of bread for his mother with a half-crown piece, spun it up in the air and failed to catch it again. The coin bounced down into a drain in the High Street. Angrily his mother told him he should watch out in future for the drain man’s cart and ask him whether together, they could search for the coin when the drain silt was ladled out. This Rob did the next time the drain man appeared, but to no avail! Brian also remembers going over to Ayres shop at the end of the war, when there was a special delivery of Wall’s sausages and each family was only allowed so many, and dropping the money given to buy them down the drain! When Brian’s Stepmother was expecting twins she had pleuresy so Brian went to stay with the Gatward family in Sheepshead Lane for 3-4 months. Their son Keith was near Brian’s age. Their family was very friendly and Mrs Gatward would always give you a big hug. Sheepshead Lane then seemed to be a big area with only a couple of houses. The Gatwards kept chicken and pigs there. Robert Frederick Arbon was born in (6 Mar) 1943. 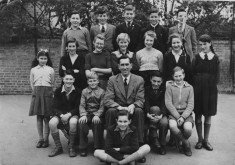 Rob is seen in the photo, middle centre front, at Harston School in the 1950s. 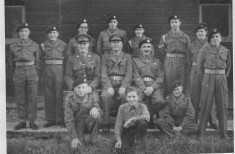 He was part of the Hauxton ATC, seen in the front of the photo, with no uniform. He went to Harston school until he was 15 then left and and worked initially for Mills and Douglas at Haslingfield, before joining Fred Willers in Button End, where he assisted Ernie Willers in setting up the joinery workshop there. Another photo shows Rob with friends, Keith Willers, second from left, Rob to right, Cheryl’s brother Smithy between them and John Pidduck to the left (he lived in cottages opposite the Church on the bend). Brian went to Harston school and during the war collected books for recycling for school, gaining a certificate for collecting 150 books. As there were so many students competing for a few places at the 11 plus examination Brian just missed out on a place for the County School but was the first pupil to be offered a place at Sawston College, along with a girl from the Manor’s Gardener’s cottage. He used to cycle all the way to Sawston, cutting through Spicers. For a short time there was a youth club held in one of Rodwell’s barns, then Ms Collins bought the Limes Farm land and house. moved the hands soon after it had struck 10 so not longer after they heard it strike 11! Brian’s not sure if it still chimes. Brian did National Service 1954-56. He cycled from Harston to work at Clare College Cambridge where he worked for 50 years. 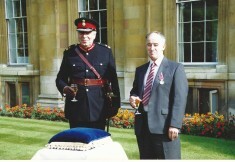 He later got a medal in 1972 at Clare College from James Crowden, the Lord Lieutenant. He left Harston when he got married and moved to Duxford. 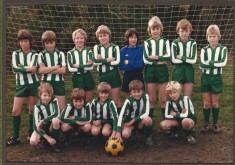 Brian’s son Jonathan David Arbon played in the Harston football team second from left in front row, along with Bill Coad’s son, Jerry, left in back row of the photo. Next to them in the High St, Harston terrace were the Blinches, a son living with his mother, a short, wide lady dressed in black. The son worked at Pest control and married a woman who had come to live in Farthing Cottage, just behind them down the lane. Further along the terrace lived the Rodgers family with sons Alec & John, and even further were the Hartshorn family (Val Joslin’s). They had to go along the back passage behind Brian’s house to get to their back door. On a Sunday if Mr Harsthorn saw them he used to ask the Arbon boys if they were going to the Baptist chapel, which they attended, but didn’t always rush to go! Down the lane behind them were other cottages- the first one was called Farthing Cottage. There were also allotments- one of which the Arbon’s had. Further down Mr & Mrs Swan had a chicken farm, and also kept some pigs. They lived in the house fronting the High St on the other side of the High St. Mr Swan was also a carrier, going to Cambridge on Mondays and selling other people’s produce for them. His daughter Peggy married Vic Clarke. Vic played football and Mr Swan supported the local football when he retired. Mr Burl lived in the present P.O. and sold sweets part time but also had a job at the Plant Breeding institute in Trumpington. He used to mutter to Brian when he bought a quarter pound of sweets – ‘I don’t suppose I’ll make much money from this’. On the other side of the High St opposite them was the General Stores which sold cigarettes and food. The Hedger family lived in the cottages opposite Brian’s on the other side of the High St road. Nearby was the Limes Farm/house where first the Rodwells lived, then Ms Collins. She was a large lady who kept horses. To the right of The Three Horseshoes lived Bill Segrave. He ran a taxi service. He was also part of the Homeguard. They used to train in the Chestnuts (field off to the left after bridge leaving for Haslingfield) on Sunday mornings then go to the pub with their rifles, which they would drop over the hatch as they arrived, out of sight. Clarence Laman was the officer in charge, their friend Graham/‘Grimble’s’ dad. Reg Ayers had the general stores shop opposite the village hall. He used to live in a bungalow in Hauxton that was knocked down when Pest control was built. He used to drive to Harston in his car. AB Northrop used to work with him. AB lived in the first house to the left in Manor Close. Miss Jackson’s was the hairdressers to the left. (Her sister was a school teacher). Brian’s wife Jean knows Wendy South who says she started her first hairdresser’s job in Harston, but no longer lives there. The shop (Green Man?) opposite the Coach & Horses, once a dairy, was run by the Wisbeys. The Wisbeys also kept pigs down the lane by Brian’s house, like the Swans did. Between the Wisbey’s shop and the old Post Office (No 53 High St), on a rather overgrown plot of land, was another shop where Brian’s father sometimes helped, as did Brian on occasions during the war. Charlie Rodgers had the shop before the Knights, then Charlie ran a bread van round, although the main bakery was the Harrisons in Church Street. Brian used to get the bread from there- it was all laid out on the floor at the back. One character Brian remembers was a Mrs Stockbridge who had a strange voice- as if she spoke through her nose. She lived in a house between Manor close and the garage, as did David Deacon. Alan and Wendy Farrington lived in the end house nearest the garage (now Porsche Centre Cambridge) . To the south of Manor Close were built the Pest Houses. The first house next to Manor Close housed the Alexander family where Brian’s friend Gill lived. In the houses opposite the War Memorial lived the Custersons, and further around on Royston Rd lived Tom Butler who kept chickens. His boys are now builders in Shelford. Down Button End were the sandpits/gravelpits, after the row of cottages fronting the road (Greystones, etc), where Brian could watch the sandmartins. Richard Harvey, who went to Sawston College with Brian, lived in an old caravan in the old pit there. Ted Stittle, a worker for Hays, lived there in one of Hays’ cottages with his wife, but now lives in Fulbourn. Dave Stittle and his wife Wendy (nee Burl) lived in a cottage further round on Button End. This page was added on 06/09/2016. I feel quite ashamed of the way Mrs Stockbridge was treated especially by us school children. We would be playing in the front play ground at Harston school and see her coming, we would all crouch down behind the wall and as she went by call rude names, She would respond by waving her stick at us. Later in her life my Mother Grace Farrington used to visit her, with me in tow, Mrs Stockbridge would let us in and then lock the door which left Mum scared, I was there for what reason I don’t know apart from being a general nuisance. For Mums help Mrs Stockbridge gave her a silver sugar sifter which I now have. The Custersons ‘In the houses opposite the War Memorial ‘ (Bath Cottage ) were Anita, the daughter of John Richman Badcock, the baker, her husband William Custerson and their twin daughters, Judy and Shirley. She nursed her widowed father until his death in 1950. They later moved to Wimpole, and she is buried in the cemetery at Harston.